A home recently constructed by Destin Magazine’s 2014 & 2015 ‘Best Construction Company,’ ChiMar Construction. This home is professionally decorated home finished & was finished in 2012! Sleeps 8 comfortably. Kick back & enjoy the outdoors from any of the 3 porches decorated with Adirondack chairs & comfortable wicker furniture. We have included flat screen TVs in all bedrooms & the family room as well as password protected Wi-Fi access and iphone chargers for the technology enthusiast. 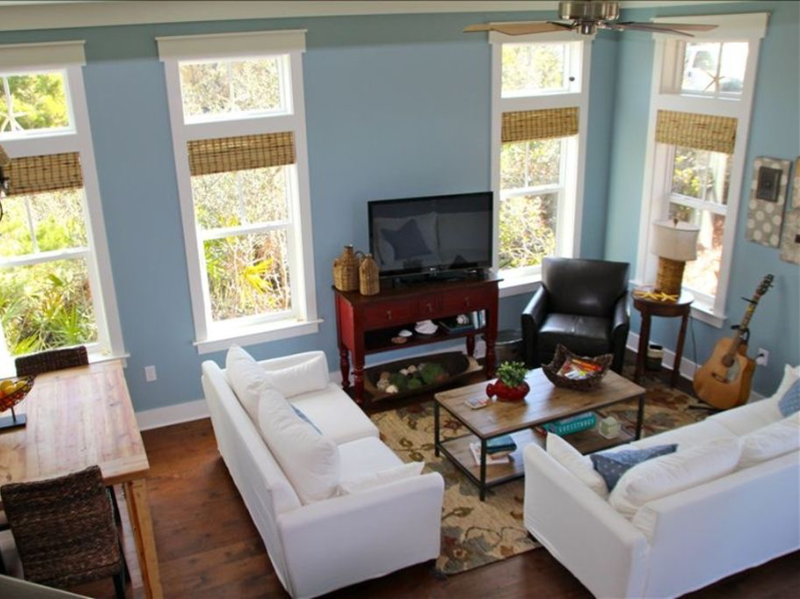 We have decorated in a beach casual theme with the latest in countertop surfaces & beautiful hardwood floors. The master suite upstairs has king sized bed, a walk-in shower with a rain shower head, a walk-in closet, a private balcony/porch, and a desk/make-up area. Our guest room has a queen sized bed and a private bathroom. We have a bunkroom with built-in bunks to accommodate 4 with a private bath. Plenty of parking – both off street and curb parking. The Summer Palace backs up to a wooded preserve and the bike path to Rosemary Beach – a great area for kids to play outside. Start your vacation right away and don’t worry about packing it all or heading straight to the store…For your convenience we have included shower gel & shampoo in all bathrooms as well as a start of coffee filters, beach towels, laundry detergent, and dishwasher detergent. Additional amenities include high chair, pack-n-play, umbrella stroller, beach toys, umbrella, chairs, & a cooler. Enjoy the short stroll to the 12,000 sq/ft pool with fountains and multiple sundecks. Walk or bike to dinner & shopping in Seacrest, Rosemary Beach or Alys Beach. When you are bound for the beach jump on the shuttle to enjoy the beautiful white sand beach & emerald water of 30A!